Improved pliers, tougher tools, wrist-flick deployment. 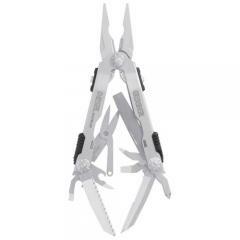 The industrial-strength Gerber Diesel Multi-Plier is all business and ready for action. With the simple flick of a wrist, the Gerber patented one-handed opening plier flies into place, ready to tackle any job. The bigger, tougher, all-locking tools are in a class by themselves. With this Gerber Multi-Plier on your belt or in your pack, you can be sure all of your projects will be finished in a snap. Needlenose pliers, wire cutter, wire crimper, partially serrrated knife blade, cross point screwdriver, small, medium and large flat blade screwdrivers, can opener, bottle opener, file, saw and scissors.